The Shanghai Cooperation Organization: China’s NATO? While much about the group remains a mystery, one thing is certain: at the SCO, China reigns supreme. On Friday leaders of Central Asian nations will meet at the Shanghai Cooperation Organization (SCO) summit in Bishkek, Kyrgyzstan. China arguably wields the most power of the countries involved, and the propaganda mills in Beijing are pumping out content hailing the importance of the upcoming meeting. In the end, though, what does it really mean for the Middle Kingdom? The SCO, previously known as the "Shanghai Five," is made up of major and minor players; while China and Russia are the main attractions, Kazakhstan, Kyrgyzstan, Tajikistan and Uzbekistan sit on the sidelines, hoping for a spot in China's "Go West" strategy. There is a lot on the agenda to cover, from China's pipelines to security in Afghanistan. However, one thing is clear: China holds the reins. 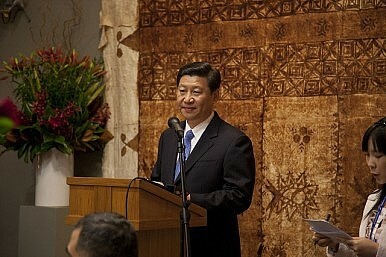 Currently, China's celebrated lord and master Xi Jinping is touring the Central Asian nations to much fanfare back home. The state run media is following his stops in each country closely, hanging on every written promise of upholding the rule of law and that China will provide 30,000 government scholarships for SCO member states to study in China. Indeed, the SCO isn't just a meeting of like-minded nations; it's a chance for China to show off its charm. Perhaps the clearest sign that other SCO states are merely window dressing came earlier this month when Chinese and Russian troops carried out joint military exercises in the Urals, leaving everyone else to ask, "Where are the other four members?" Still, there is no shortage of countries that aspire to join the SCO, such as India and Pakistan, both of which serve as observer states, and Turkey, whose Prime Minister, Recep Tayyip Erdogan once joked that he would abandon the EU for a spot in the "Shanghai Five." Despite the seemingly innocent comment, it sparked concern in some quarters that Turkey would actually make good on Erdogan’s threat. On the Chinese side, the SCO charm offensive is underway, and if last year's Beijing summit is anything to go by, Chinese readers have a week of unending praise of the SCO ahead, complete with condemnations of Western forces, the "Western media" and NATO. While this may result in more development for the region, it also means legitimizing and promoting things like China's human rights policies, giving them a broader banner of support. The SCO's stated enemies are "terrorism, separatism and extremism," known collectively as the "Three Evils.” Under the broad stroke of "counterterrorism," the group's official line on security has been called by some a "vehicle for human rights violations." While the rhetoric on human rights from the SCO is par for the course, in practice the "Three Evils" are a catch-all excuse for domestic crackdowns. As the most powerful and involved country in the SCO by far, China has the power to shape the domestic policy of the whole of Central Asia, an upsetting prospect for many. The countries on the sidelines — Kazakhstan, Kyrgyzstan, Tajikistan and Uzbekistan — are not exactly havens of egalitarian bliss. In fact, according to Freedom House, the highest scoring member of the six SCO nations is Kyrgyzstan, which comes in at barely "Partly Free." However, while the rest of the world looks with concern on the endless torture in Kazakhstan and the imprisonment of Azimjon Askarov in Kyrgyzstan, China supports development above all else, opposing even so much as rhetorical humanitarian intervention. For now, the economic cooperation of the SCO has been compared — by Xi Jinping and others — as a new Silk Road. For China, security at the SCO takes a backseat to oil. China's investments in Kazakhstan alone are staggering, including most recently Beijing buying up an 8.4 percent stake in the Kashagan oil field (a US$5 billion deal) in the Caspian Sea. Central Asia is crucial to diversifying China's oil imports, and Beijing doesn't have to worry about unseemly protests like those seen in the emerging democracy in Myanmar. While some believe the SCO is designed as a counterbalance to NATO, the future of the organization is uncertain. With this in mind, it's important to note that the SCO can do serious good for ailing nations like Afghanistan, but, as with all things, it could come with a political price tag. While the Chinese press will bang on about progress and development from the SCO for the next week or so, the purpose and goals of the SCO are largely a mystery — even possibly to the members themselves. At times they seem to exist simply to convince the rest of the world of the group's diplomatic legitimacy and relevance. While the world has the power to gauge the legitimacy, the organization's relevance rests solely with China.